Some of the most interesting roadside history involves the lesser-known sites that don't make the American history books or History Channel. Illinois has lots of those, and Starved Rock State Park is one of its most popular ones. It's located very close to the intersection of Interstates 39 and 80, about halfway between Rockford and Bloomington. In 1673 it was also located at one of the earliest traffic routes across Illinois, the Illinois River. That is when King Louis XIV of France sent Louis Joliet and Father Jacques Marquette to explore the unknown midlands of the continent, with a mission to locate the river called by the Native Americans "Messipi," or the "Great Water." They started at Lake Michigan, found a route to the present-day Mississippi River, and canoed down to about the mouth of the Arkansas River. 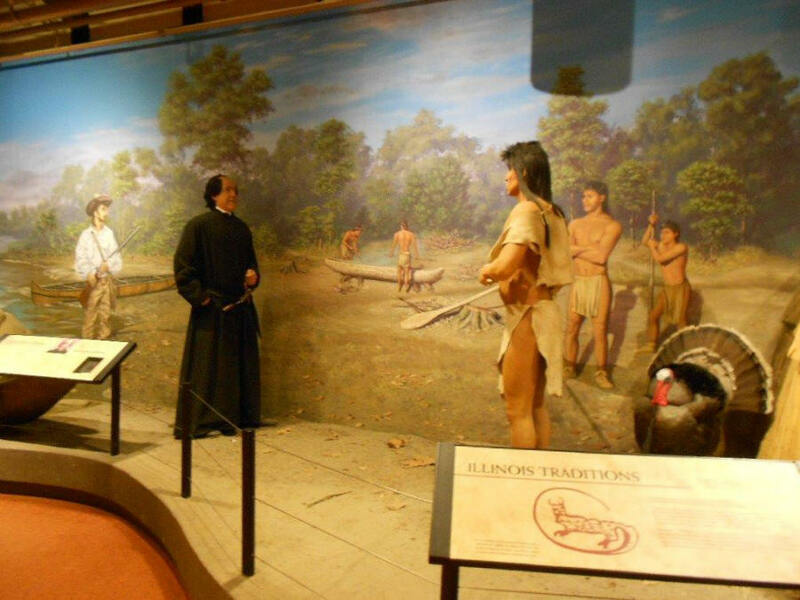 Native Americans there warned them about Spanish downriver and the explorers decided to head back to Quebec, but by a shorter route volunteered by the Native Americans, the Illinois River. 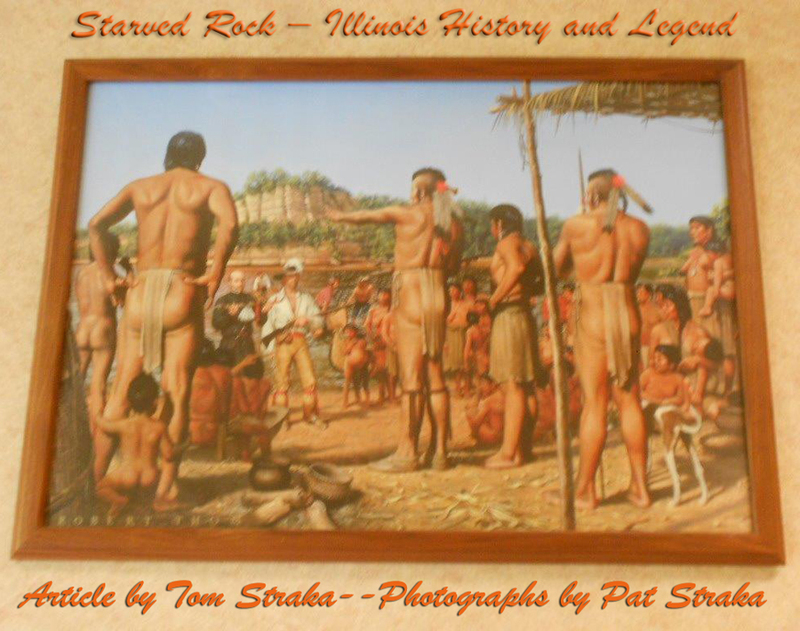 They became the first Europeans to reference Starved Rock (or as they called it Le Rocher). The Kaskaskias there welcomed the explorers and Marquette returned two years later to establish the Mission of Immaculate Conception. Many more Frenchmen followed and Le Rocher was a landmark on the river. Father Marquette meeting the Illinois. The French explorer La Salle was preeminent among these and saw the strategic nature of the place. In 1682 he constructed a fort on the top of Le Rocher. It was called Fort St Louis and was intended to protect themselves and their Native American allies from aggression of other hostile tribes. It was also part of a chain of forts that extended from Canada all the way to New Orleans that served to stifle intrusion of the British into this region. The fort had the strategic advantage of being built on a natural fortress and this was supplemented with palisades, bastions and a parapet. Inside were cabins, a storehouse, and, of course, a chapel. 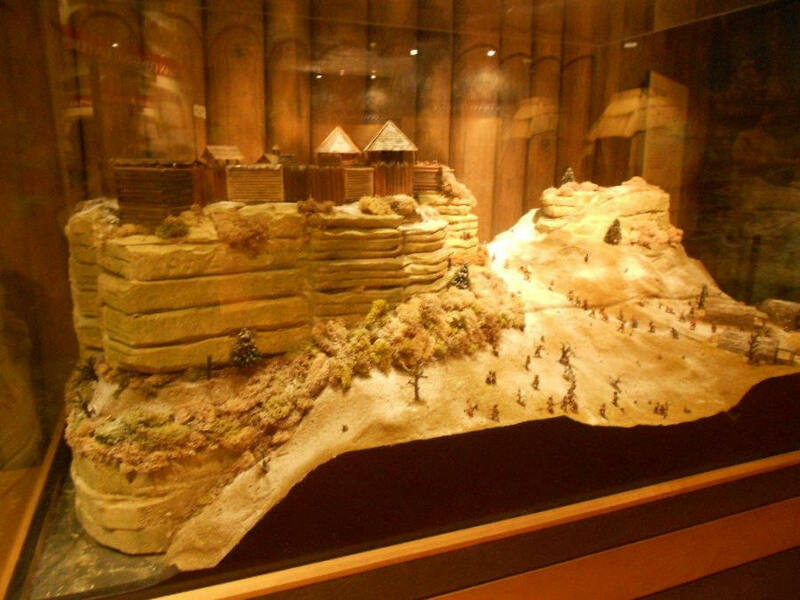 Model of Fort St. Louis on top of Starved Rock. In 1684 the Iroquois attacked the fort with a six-day siege, even attempting the impossible, an assault on the fortress. The fort proved impenetrable and the Iroquois retreated. It remained a center of French power and influence in the Mississippi Valley for most of the remainder of the century. In the early eighteenth century it was abandoned and Le Rocher even declined in commercial importance, but remained a landmark and place of rendezvous for traders. The 206-page history by Osman (online link included below) is an excellent read and is recommended before you visit Starved Rock. How did Starved Rock get its name? There is a legend, not well-supported by history. The legend attempts to explain why the local Native Americans, "the Illinois of the Rock," no longer exist. The Illinois lived quietly near Le Rocher, in a village and farmed, hunted, and trapped. However, they had enemies, and Indian wars were common in the Illinois River Valley. In 1769 the chief of another tribe, Pontiac, was attempting to develop a confederation of Indian tribes to drive the French from the region. The Illinois were friends of the French and refused to take part. While negotiating the alliances, Pontiac was brutally killed by an Illinois Indian, starting an Indian war. The Illinois were attached by the Pottawatomi and retreated to the top of Le Rocher for defense. 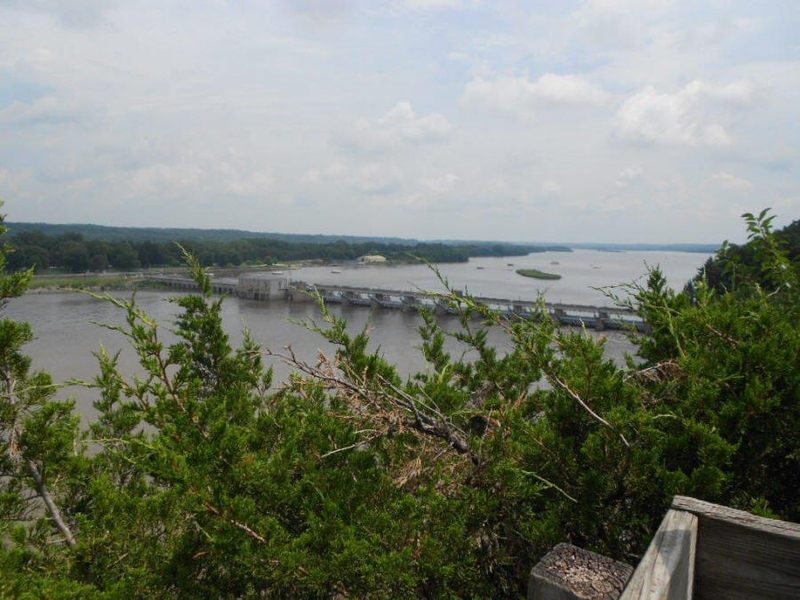 Illinois River from atop Starved Rock. The Pottawatomi attempted to scale the bluffs, but were always easily thwarted. A siege became the tactic and the attackers waited at the bottom of the bluff knowing the Illinois would eventually have to come down when food and water ran out. The Illinois attempted to get water by lowering vessels to obtain water. Their enemy sat below in canoes and cut the ropes of the vessels, depriving the Illinois of water. It took three long weeks to starve the Illinois and eventually they had to descend and fight a battle. They waited for stormy weather, for a better chance for some to escape, and slipped down the slope. A battle ensued, and the Illinois were wiped out. They were starved off the bluff, so named the rock. One trail leads to lover's leap. This legend says an Indian brave from the local tribe was in love with a maiden from a different tribe. Marriage between tribes was forbidden. The two lovers could not stand being apart and met one evening on a bluff near Starved Rock, embraced each other, and leaped into the water below. Aren't all attractions like this required to have a lover's leap legend? There is a trail leading to the spot where they chose love over life. There are other legends, even a buried gold legend. Starved Rock today remains pretty much like the early explorers found it. The natural beauty has been preserved and only real difference between then and now is better developed trails and a few benches. It is easy to appreciate the geology, history, and aesthetics of the place. It is a state park and there is development, but nearby, not on the bluff itself. It is possible to spend the night in Starved Rock Lodge. It is a grand lodge, built in the 1930s, with the largest two-sided fireplace in the state. Educational programs and guided hikes take place at the lodge, and there is a restaurant. If the lodge it too fancy for you, there is a campground with 133 camping sites. Also, there are trolley tours and water cruises. The "Belle of the Rock," an authentic paddle wheel boat, allows for a view of Le Rocher from the river. The logical starting place for an adventure in the park is the visitor's center. It is full of educational and interactive displays, like a model of Fort St. Louis that was atop Starved Rock. The three-dimensional topographic map of the park and surrounding area will give you useful insights on how to best explore Le Rocher. There is even a 400-gallon aquarium holding fish that are found in the Illinois River. The real attraction to us was the history and nature. Starved Rock has some stunning natural features and its place in history makes for a fascinating backdrop. 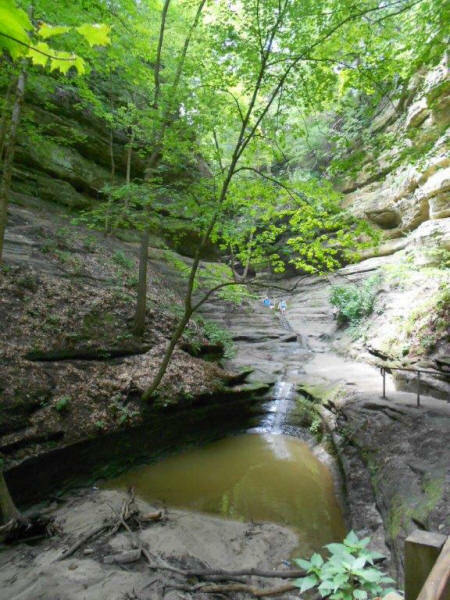 The bluff obviously stands out from the surrounding farm country of Illinois, but what is unexpected are the canyons and waterfalls that are part of the park. Glacial water eroded the area, but not the resistant St. Peter sandstone, and eighteen canyons with steep walls were formed. With the right conditions, mainly in the spring when the snow and ice melt or after heavy rainfall, almost all the canyons have stunning waterfalls. Gorges and waterfalls in Central Illinois? Yes! And even more; in winter the freezing and melting creates ice sculptures in the canyons. Spectacular icefalls become a wintertime attraction. One of the eighteen canyons, with a smallish waterfall. Even out of season it's still beautiful. Canyons contain all kinds of interesting sites. Starved Rock is a gem and it's located right off the interstate. The only negative might be that it has been rated a top attraction in the state. We were there at probably the peak of tourist season and it was crowded. It was pretty easy to understand why; it's a fantastic state park. 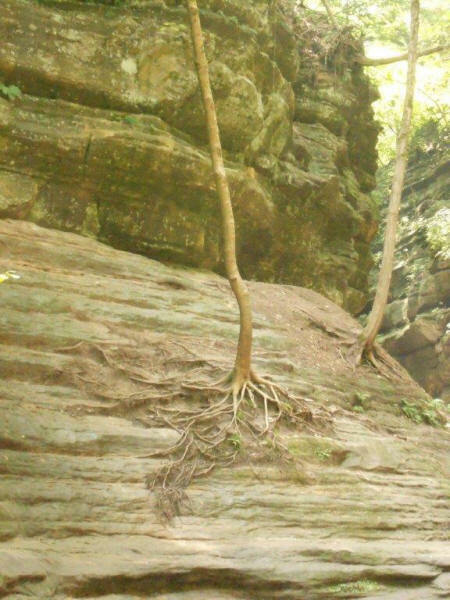 Starved Rock: History, Legend, and Lore.